I just wanted to let you know that the product mentioned below, I received for free to try out and review and/or received compensation for it. Regardless, all opinions are my own. Thanks so much for reading and enjoy!! The other day I went over to my sister’s house and one of my nieces, Kaylyn, and I had a little photo shoot outside! 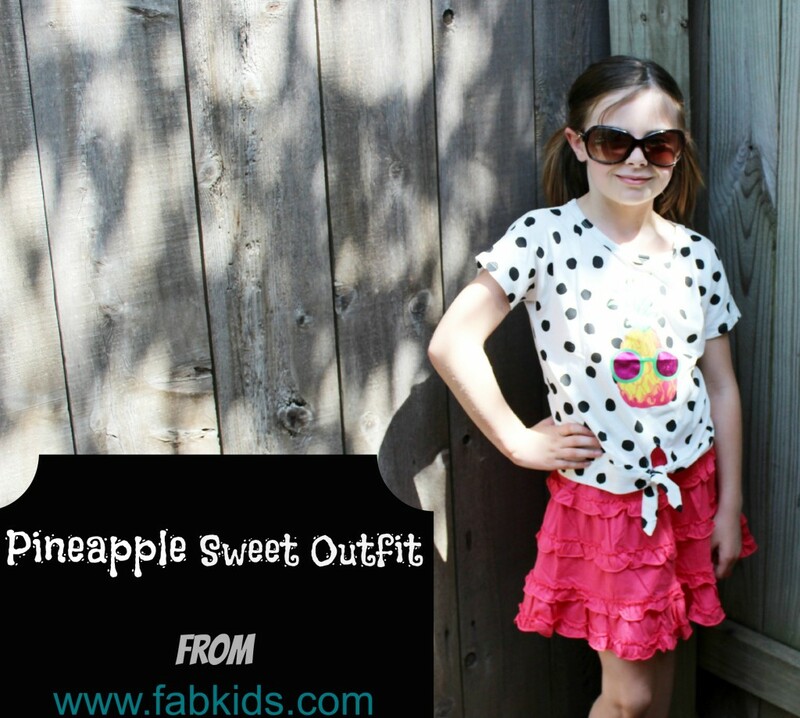 She picked out this adorable Pineapple Sweet Outfit from FabKids, and she was dying to try it on! She saw it and just laughed and said, “That Pineapple is So Funny”. She is such a cutie pie! 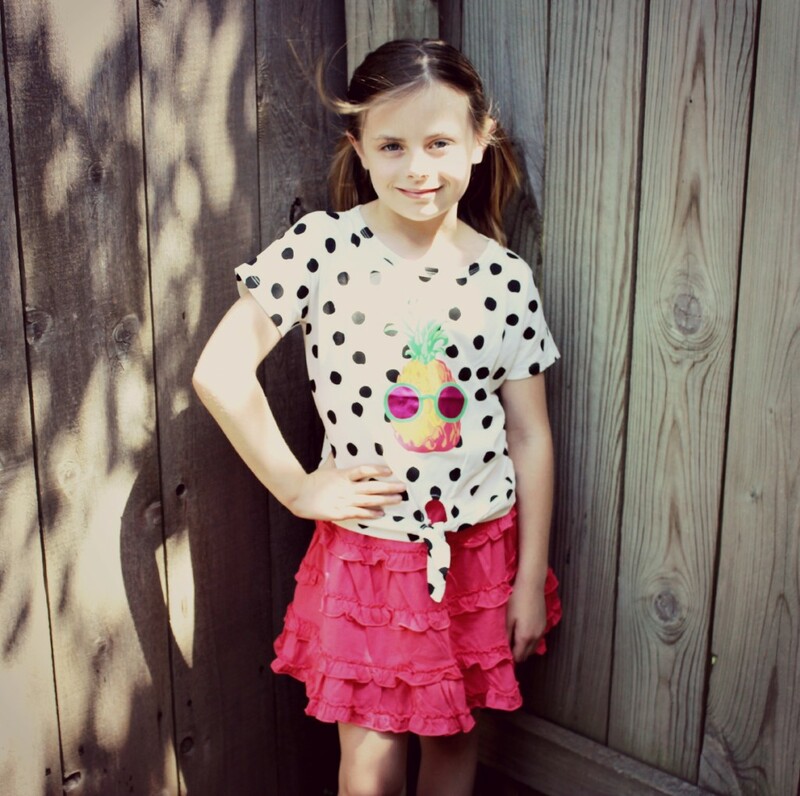 If you have never heard of FabKids is JustFab’s newest fashion club, that was started by a team of parents, including actress Christina Applegate! It is a really great way for parents to join the club, and get monthly selections of super cute, high quality and affordable clothes, without having to leave your home! Every Outfit includes 2 pieces, they have dresses paired with leggings, or tops and bottoms! They have sizes 2-12, and is for girls and boys! The outfit we received is great quality, and I love the fun and sass it has! I think this is a great idea, to have a site like this. If you decide you don’s want an outfit for the month, you can skip the month, if you request that by the 5th. If you want an outfit on the 6th of each month, it will give you a credit to the site, to pick one 2-piece outfit for $29.95. Not to bad! This is a higher quality of clothes, plus a great brand, it is worth the money! Super impressed with the quick shipping and quality of the outfit we got! They have so many cute items, it is hard to choose which one you want! I highly recommend this site for parents, or those who want to send a gift to a loved one! Head over and www.fabkids.com and join today, or just take a better look at the site. I think you guys will really enjoy it! 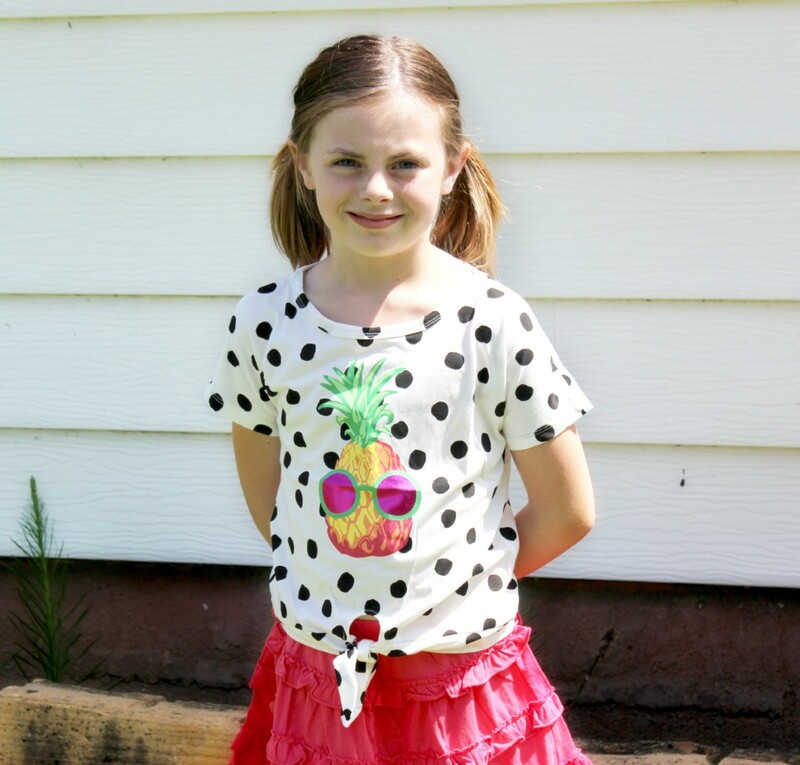 If you are wanting the outfit Kaylyn is wearing, it is the Pineapple Sweet Outfit. Have your or someone you know shopped at FabKids? That dress is adorbs! I have all boys, but I have a couple of nieces that would totally rock that dress, too! What a cutie rocking the sunglasses. I love the ruffled skirt, and the shirt tied at the waist is adorable. That’s adorable! Love her in those shades!! We love Fabkids at our house! Their stuff is such great quality! That is such a cute outfit! And Kaylyn is quite the model, too! So cute and unique- lots of cool options for all ages! She looks perfectly sassy and adorable! I love her outfit! You had me at Christina Apple gate. I love her! This sounds really cool, and I love the outfit! Kaylyn is totally rockin’ that outfit! These are great photos. You had a great model! That is an adorable outfit and she looks super confident in it as well! I love that she has a spunky little outfit but it’s still appropriate for her age. Very cute! Adorable! I love the skirt especially. Very cute and fun summer wear, my daughter would love this! I love the tie at the front of that shirt, I notice many have them this season – so cute! What a fabulous outfit and she looks great in it. I am off to check out FabKids right now. Thanks for sharing. This is adorable! I will have to check for cute outfits for the kiddos! Your daughter is such a little fashionista! SO CUTE!! Love her outfit.